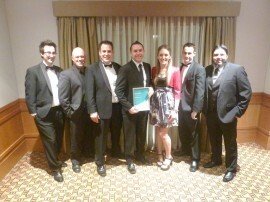 HRMWEB awarded as one of Telstra's 2012 Business Award Finalists! We are proud to announce that HRMWEB was named a finalist in two 2012 Telstra Business Award categories: "People's Choice" and "Small Business of the Year". We are particularly chuffed to be a finalist in the People's Choice category as it relied on voting by the public for the business that they wanted to support. Many thanks to our clients and their staff who voted to get us over the line and into the finalist group!